Dual-screen laptops or netbooks are the current trend, all simply because we need more screens to cope with our busy life. 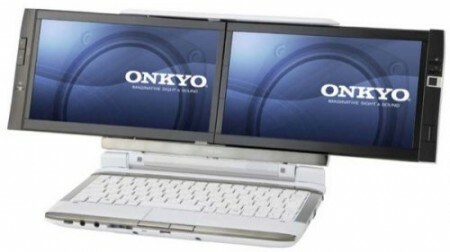 Here comes another dual-screen laptop, the Onkyo DX, which looks very close to what the few dual-screen laptops that we’ve seen before. The Onkyo DX features two 1,366 Ã— 768 10.1-inch LCD screens. Under the hood are a 1.6GHz Athlon Neo MV-40 CPU, ATI Radeon HD 3200 graphics card, 2GB RAM (expandable to 4GB) and a 320GB 5,400 RPM HDD. It supports Bluetooth 2.1 +EDR, WiFi and Gigabit Ethernet connectivity and comes with three USB ports. The pre-loaded operating system is Windows 7 32-bit and the price is about $966. This entry was posted in Gadgets, Hardware. Bookmark the permalink.